A: Nowadays, you don’t have to flip far in a design magazine before you’ll find a feature on an outdoor room, and homeowners and renters alike are doing some amazing things in the world of exterior design. In fact, people aren’t just creating comfortable sitting spaces on their patios, they’re even creating full outdoor kitchens—range, refrigerator, bar…the whole nine yards! Just as area rugs play an important role in the design and function of your indoor space, so can they too in you outdoor room. 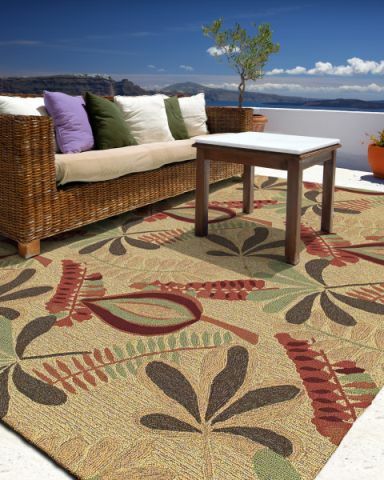 Indoor/outdoor rugs come in a variety of designs, from traditional to contemporary. Today, the majority of these rugs are constructed of either synthetic polypropylene or polyacrylic fibers that are made to withstand almost anything Mother Nature could throw at them. Polypropylene is a plastic that can easily be dyed and turned into a fiber (it’s also often referred to as olefin). As a plastic, it’s rugged, durable, and resists permanent stains. Unlike nylon, a comparable fiber found in rugs for indoor use only, it doesn’t soak up water, making it mildew-resistant. Rugs hand-tufted with a polyacrylic pile are also mildew-resistant, yet they offer the look and feel of a wool rug (typically at a lower price point). These synthetic fibers can also be dyed with a solution that is colorfast and resists bleaching and fading. In other words, sun and rain are no match for them! Of course, you want to allow the opportunity for both sides of your outdoor rug to dry, whether it’s wet from rain or a quick hose-off. While these rugs can resist mold, mildew would surely put up a good fight with a rug left completely saturated for a lengthy period of time. Because of their durability and stain- and wear-resistance, these rugs are often used in high-traffic areas inside the home as well. As mentioned above, polypropylene has a feel similar to nylon, and tufted polyacrylic pile mimics wool, providing a soft, yet strong option for rooms like your kitchen, living room, or bathroom. This summer, find indoor/outdoor rugs to fit your style and space at any of our locations. Or, CLICK HERE to shop indoor/outdoor rugs online.